Costa Rica's President Luis Guillermo Solís says Uruguay is "cocky" toward his nation and arrogant. This kind of talk would normally spark a diplomatic row, but the two nations face off in the World Cup today. Many experts, including Goldman Sachs, predict Costa Rica (and the U.S.) won't make it out of the first round, but the Central American nation has it sights on another goal: Winning the World Cup ad game. "Essential Costa Rica" is a print and TV ad campaign running in major cities in the U.S., U.K. and Germany during the World Cup. 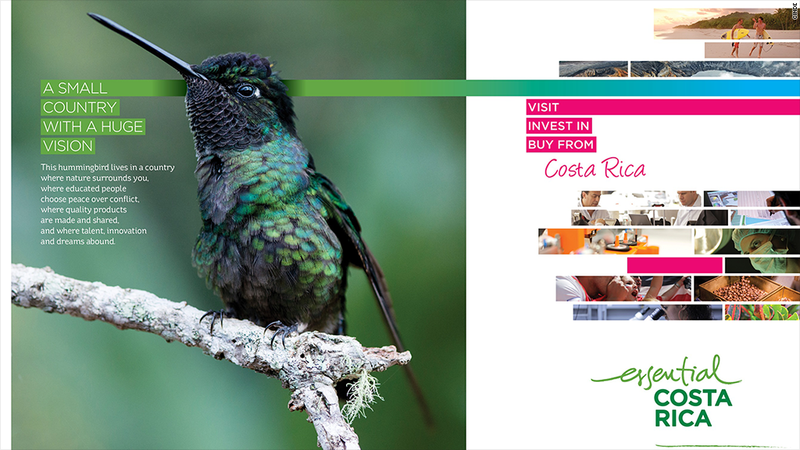 The message is simple: Costa Rica is more than a pretty place to vacation, come invest and partner with us. It's a push to shed the country's image as a Banana Republic. Only 6% of the country's GDP is agriculture today, although the sector remains a large employer. The U.S. is its biggest trading partner, accounting for about half of its exports and foreign direct investment. The country is growing its technology industry and promoting the fact that 16% of its population has college degrees now. President Solís is a good example. His grandfather had no schooling. His father made it to about high school, and he has a master's degree. Before he was elected president in April, much of his life was spent as a history professor and scholar. He ran as a "third party" candidate. CNNMoney interviewed President Solís in New York this week. This is an excerpt of the conversation. Q: Intel (INTC) and Bank of America (BAC) recently announced 3,000 job cuts in Costa Rica. What are you doing about it? Solís: Within one month of taking office, I am here in the United States speaking with investors, those already working in Costa Rica and those who may want to go. As a result, we've been able to get an announcement from Intel that their Mega Lab will be installed in Costa Rica, which is extraordinarily important for us, thus moving us from manufacturing to research and development of new products. I hope this will bring about significant change in how we're seen in the international community. We also have a VMWare (VMW) announcement saying they are expanding their activities in Costa Rica. I hope this will clear any doubt that may exist regarding the commitment of the new government to the private sector or the conditions of the country for direct investments. Q: Several analysts cut your GDP forecasts in half. Is that fair? Solís: This is not what the central bank in Costa Rica is saying. In our estimation and that of the World Bank, we are going to grow at a rate of 3.7% this year. I think it's going to go up, not down. I hope so because this is the best way we can deal with a number of challenges that we have: Fiscal, monetary and other ways. Q: How do you move the Costa Rican economy beyond tourism and agriculture? Solís: It has happened in the last 25 years. We were an early exporter of coffee to Europe. Now we have more than 250 multi-national companies, especially in manufacturing and services. We have 14 different free trade agreements -- 50 countries -- with China, North America, Europe, etc. Coffee exports today are only 3% of our goods. Bananas are 7%. Services represent 33%. We have already moved beyond agriculture. Q: Your currency the colón has fallen a lot against the dollar in recent months. Will this continue? Solís: Before the government entered into office, the colón depreciation started to jump in the band system that we have. We're going to keep the bands, but we are going to lower the volatility by flattening the bands. The central bank has enough reserves to prevent this volatility without tampering with the trend -- the slow trend -- towards devaluation, which has been good news for the Costa Rican exporters and the tourism industry. We are almost at the level we were before the crisis. Q: What would you like to see evolve in your relations with the United States? Solís: I would like to see the relationship evolve in an official way to move more from security issues related to drugs into talk of the environment, green energy and social development issues. These policies will help prevent violence, including narcotraffic. Q: A mysterious kidney disease is impacting your agriculture workers. What are you doing about it? Solís: We are researching the problem to begin with because we don't know where it comes from. We were also asked about arsenic. We're trying to find out what the problem is because it seems to be associated with certain regions.